Summer is officially here, let’s all celebrate! I love summer and I’ve been taking advantage of all the nice weather we’ve been having the last few weeks. I’ve been on mountain hikes, mountain bike rides, gone to a lovely wedding, stopped in at a few garage sales, and already had more than our fair share of picnics. Bring it on, summer, I’m ready for you! 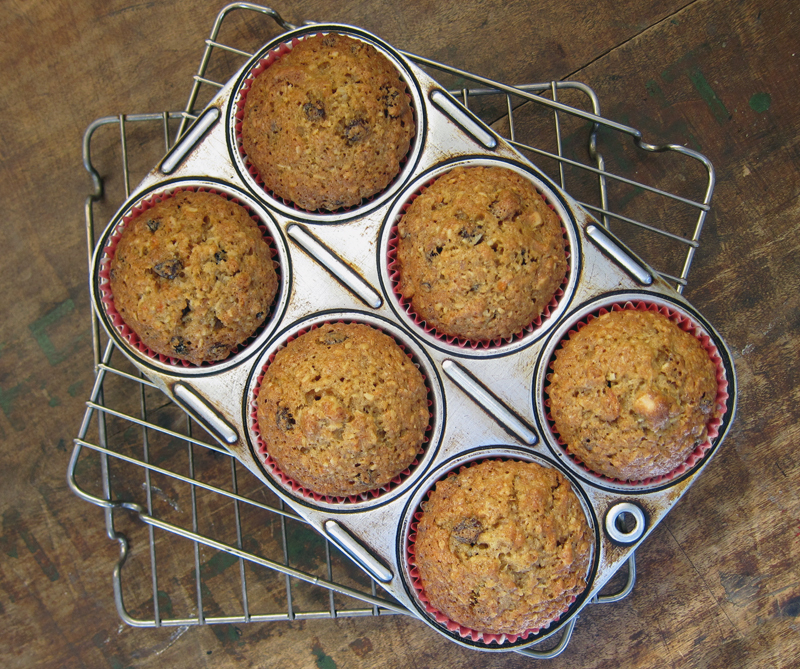 This weekend, in preparation for a hike in the mountains, I decided to bake up some muffins to take along with us. 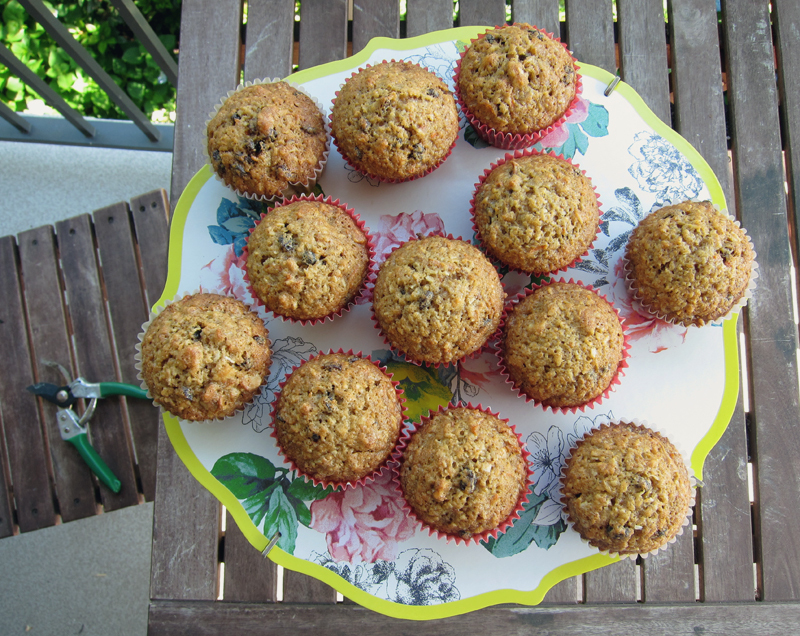 Hiking requires sustenance after all, and boy oh boy, did these muffins provide lots of tasty energy. I picked up the Butter Baked Goods cookbook from the library and decided on baking up these “twice-a-week morning glory” muffins immediately. Butter is a west-side Vancouver bakery (a shame that I’ve never been to their location), but a few years ago I did spy their amazing marshmallows at a Dean & DeLuca in Napa, California, so I know their baked goods and sweets get around. They make these muffins twice a week at the bakery, hence the name. They’re pretty much a glorified carrot cake, filled with grated carrots, apple, currants, walnuts and coconut with a generous helping of cinnamon and vanilla for good measure. 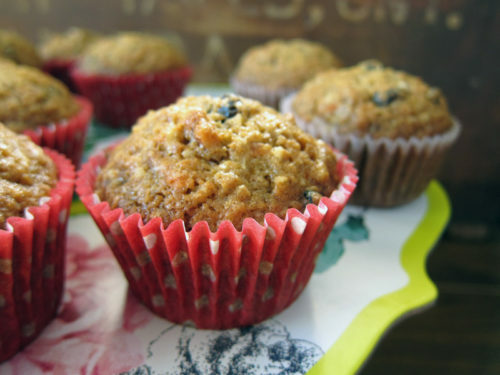 These aren’t the most healthy muffin – you’re pretty much eating cake for breakfast – but I’m okay with that. You could always substitute in some whole wheat flour or spelt for half of the all-purpose to make it a bit more hearty. I liked that the recipe mixed in the carrots and apples into the dry ingredients instead of the wet ones which made the whole thing so much easier to mix up. 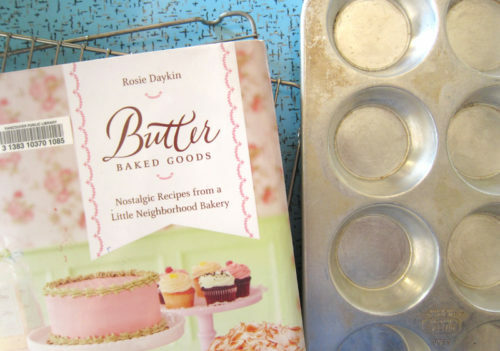 Such a great tip for not over-mixing the batter! Do you see that pretty paper cake stand? It comes from the brand new Poppytalk collection from Target. I was lucky to get a sneak peak at the collection and it’s pretty fabulous. Jan and Earl did such a great job in glamping up the outdoors for their collection, which launched in Target stores today in both the US and Canada. Make sure you snag yourself some of that prettiness before the summer ends! As for the muffins, they were road tested on a 4 hour mountain hike up to Lost Lake yesterday and they met with approval all around. They also went perfectly with our coffee (and sore muscles) this morning. The recipe said it bakes up 12 muffins. When I saw that the recipe called for 4 eggs, I figured they’d be some jumbo-sized muffins. I was able to make 23 muffins out of the recipe, but if you have large bakery-sized muffins tins, then you’ll probably get closer to 12. I found these muffins sweet and that was after I cut down the sugar in the original recipe. The original recipe called for 1 3/4 cups worth and I used 1 1/4 cups instead, but I think you could cut it down to 1 cup or even a bit less and still have a very fine muffin. Preheat oven to 350F. Prep a muffin tin by greasing tins or using paper liners. Makes 12 jumbo muffins or 23-24 regular sized muffins. In a large bowl, whisk together flour, sugar, cinnamon and baking soda. Stir in carrots, currants, coconut, walnuts and apple and mix well. In a separate bowl, whisk together eggs, oil and vanilla. Add the wet ingredients to the dry and mix until just combined with a wooden spoon. Use a small scoop to drop batter into prepared muffin tin, filling 3/4’s full. Bake for 25 minutes or until a skewer comes out clean (35 minutes for jumbo sized muffins). Remove from oven and cool slightly in the pan before removing muffins to cool completely on racks. A long hike definitely deserves a fun breakfast! Love that even though this is a bit decadent, it’s stuffed with lots of fruit and veggies! It sounds like you are having a great time enjoying the summer weather! And eating good stuff too! I haven’t been baking much lately as the weather has been getting warmer around here and turning the oven on to bake is not a wise idea. But I just know that my husband would love these muffins…anything carrot cake-like disguised as a healthy muffin is right up his alley. Here’s to more hiking and picnicking in your future. I really need to start doing more of that too! 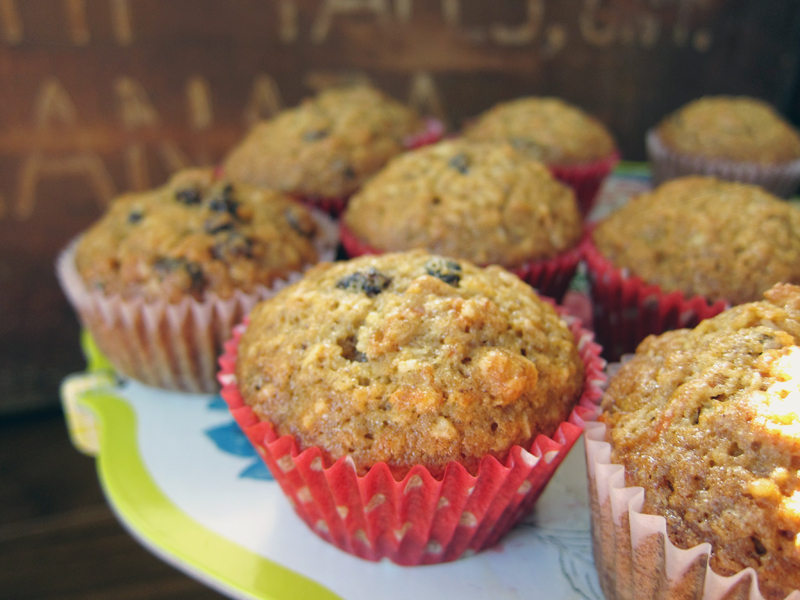 I’ve made these muffins a few times now over the last few months, yummy! I cut down on the oil by using 1/2 cup vegetable oil and 1/2 cup buttermilk. Works AOK! Joanne, yes!! These were great as a hiking snack 🙂 Sugar= energy which was well used. JoanneM, we’re lucky that it never gets too hot here, plus we face north and our apartment never gets very hot (phew!). Yes, here’s to more picnics and summer exploring! Karen, great tip! I’ll definitely try that next time – I actually have some yogurt to use up, so I might try that instead. Thank you!! 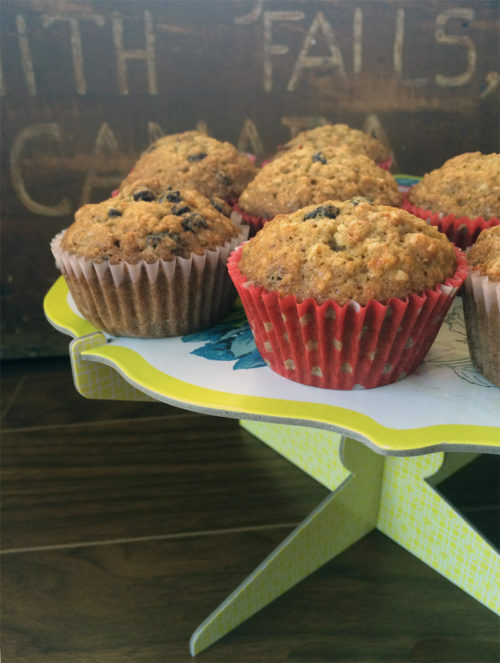 Glad you love these muffins – I think they’re pretty fantastic too. I just made these and they’re yummy. love the tip about cutting the oil and using buttermilk instead. I also added 1tsp of salt. i always feel something sweet needs a little balance. Have a great day! I made these last night and they are delicious! I reduced the sugar by half and will try the buttermilk trick next time. Rochelle, so glad you made them! Yes, it is strange that the recipe didn’t include salt, but there is quite a bit of baking soda in them so I was nervous about adding any. Glad it worked out well. Thanks so much Petra! So happy you made these and they turned out so well. so glad i found you on FBC! hello fellow vancouverite, these muffins look delish! I’m going to have to bake these. They look amazing. Made these this morning and they are so good! The recipe made 12 muffins for breakfasts for the week and a loaf for the freezer. I used 1 cup of sugar and I think next time I think I’ll try the oil/buttermilk idea too. Thanks Connie, nice to meet you too! Tammy, so glad you enjoyed these! I made these today with whole wheat pastry flour, spelt flour, & coconut sugar. Turned out not too cakes. Thanks for sharing these! Kim, so glad you loved these!! Hooray! Salt is totally missing from this recipe, Especially since no butter. I added a bit to it. Don’t know of other made a difference but I’m pretty sure it did. I could cut back on sugar for sure and next time will try out whole flour. Very tasty! Great for the little one. Thanks Courtney, yes, it could probably do with a bit of salt and next time I’d use only 1 cup of sugar as I mention in the headnotes. Glad you enjoyed the flavour!